stayed in this hotel 4 times now. very clean, great staff. food not bad. good location although up a hill. plenty cheap bars round about. hotel entertainment average. would go back as have been in much worse hotels at double the price. pool area great. beds are 2 euros each but then you can get one at any time. Rooms spotless, the food was typical hotel food and perhaps a 3 is a little unfair but we ate out the second week. Right in the middle of everything, if you don't stay on the beach in Benalmadena you have a hill to climb and the San Fermin is no worse than most. The staff were faultless, from the cleaners to the bar staff and reception. Really excellent. We are just back from this hotel today. We found it to be better than what we were lead to believe. The food was very good and the hotel was very clean. They had entertainment on every night and people seemed to be having a good time. They also had activities during the day. It was a bit difficult to get a sun bed at the week end as there seem to be a big intake over the week end. We got there early on Sunday and got a bed ok and by ten thirty they were all gone. Monday there was beds left over. The towels changed each day and even maid service on Sunday. We are in ouur early 60's and had no difficulty with the hill. Returned today from Hotel San Fermin. I have to say that myself and my teenage grandaughter thoroughly enjoyed the hotel. The staff are friendly and very helpful. The maid service is excellent. The food is very good, the restaurant is spotless clean and run very well. Just one small gripe and that is the sunbeds, they charge 2euros per sunbed per day, which I found to be unusual, never had to pay for sunbeds in any other hotel that I have stayed. But that is the only thing that I can complain about. Would recommend this hotel a good all round 3*** Hotel. First time in this hotel and was very impressed, the staff were lovely and friendly and always ready to help. Our rooms were cleaned everyday and the view from our room was a huge bonus as we had the sea to one side and the mountains to the other overlooking the pool. The balcony's were a very good size fitting two chairs and a table. The restaurant was kept very clean and for bed and brekfast you couldn't grumble with what you were given, the variety was excellent although it was pretty much the same everyday. The so called ''cardiac hill'' not at all it was fine especially after a few drinks!! Overall the hotel was brilliant and the swimming pool was cleaned everyday and to be honest you couldn't fault it. A well deserved 3*** hotel. Just arrived back from this hotel and we had a brilliant time.All staff were very friendly and helpful. Maid service was great, towels changed every day and beding every other day.The food was very good with a great selection for both breakfast and evening meal.More choices than I care to remember and we tried dishes that we might not of done otherwise. Hill", it is quite steep but you soon get used to it. We used to call at some of the bars on our way up it. FAGINS BAR,run by a great English couple Doug & Yvonne, situated not quite at the bottomon in a side street on your right on the way up, is a great bar. 1 euro a pint of lager - yes cheap but very good. Would definately visit the hotel again despite the hill. The food in the hotel was great. The hotel was very quiet when we visited so there was no ques or rush. The was a great choice of salads, a different soup each night, loads of vegetables and about 5 different meat dishes. There was also show cooking every night and kids section at the buffet. The waiters in the hotel couldn't be nicer. The hotel is at the top of a very steep and is a 20 minute walk from the marina. The hotel is well situated for Paloma Park and Aroya de la mil (the spanish end of town). The hotel is only a 20 Euro ride from the airport. There was no entertainment or kids club when we arrived in April. It did start the first week into May. This is our 4th stay in this hotel this year the hotel is very clean and the staff very helpful. 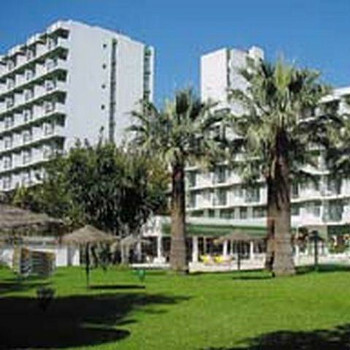 the hotel is central for the beach nightlife and a lovely public park not far from airport. We felt that the rooms were fairly basic but spotlessly clean,You only sleep in them after all!plenty of hot water. Air-con was very welcome as weather was really hot when we went. Pool area and all public rooms in the hotel were polished to perfection! All staff were very pleasant and extremely hard-working. Food consisted of international fare with a real Spanish flavour. Lovely salads and soups and occasionally fresh prawns on offer at dinner. Plenty of fruit and a good selection at breakfast. Bar prices very reasonable with a good selection of wines at dinner. Entertainment was OK with a disco for the children and live music etc. Lots of different nationalities visiting including Americans,French, UK, Spanish etc. never a dull moment! We even had about 50 Spanish 8-9 year old boys in the hotel (a Soccer School) during the World Cup! They were playing in a tournament on the beach and came home with several trophies. Would really recommend this hotel for the young at heart and those who enjoy life to the full!A great hotel in a lively resort but quiet enough to get a good nights sleep. The hotel was extremely clean and the pool & garden area were well looked after. There is a charge for the sunbeds but this meant that everyone had a fair chance of getting one. The prices at the bar are bery reasonable for a hotel (cheaper than some of the bars roundabout). The rooms weren't huge but enough for every day needs. The food was OK - fairly standard stuff and the staff were quite friendly. We didn't think much of the entertainment - it seemed to be more geared towards older people. The San Fermin is at the top of what is called locally 'cardiac hill' but it's not too bad. There are bars on the way up too so there's plenty of excuses to stop for a drink. For a really good Sangria, go to Chrissies Bar - it'll blow your socks off.